Ever since graphics could render more than a dark smudge on the skin, developers have been adding increasingly intricate tatts to their gaming characters. Join us as we ink ourselves up with the trendiest tattoos on PlayStation. ‘Cut here’. Talk about a deliciously dark tatt. Of course, this is Trevor Phillips you’re dealing with. GTA 5’s resident psycho dresses so scruffily, and has such disdain for his appearance, he makes hobos look like catwalk models. It’s no surprise his neck art is so brazenly nihilistic. Need a hug, Trev? If you’re going to earn a nickname based on your tatts, you’d better make them kickass. Luckily for ‘The Dragon of the Dojima Family’, he got a fiery serpent plastered on his back, rather than, say, a sausage dog. Much as we love Kaz Kiryu, ‘The Dachshund of the Dojima Family’ doesn’t quite have the same ring to it. Delsin Rowe is such a tool. Yes, you can ruin billboards with graffiti. Bully for you. We will give the smokey superhero props for his fetching arm art, though. We’re not quite sure what his tattoo is supposed to be, but we can sure zoom in close on it thanks to Second Son’s ace camera mode. WWE games have long had a thing for tatt-branded cover stars. CM Punk. Brock Lesnar. The Rock. The latter was even nicknamed ‘The Brahma Bull’ because of his badass bicep ink. In 2003, he got his other arm tattooed with a partial Samoan pe’a tatau, reflecting his heritage. Rocky sure loves his elaborate body art. Have you ever pined for a tattoo but were ultimately put off by that whole pesky ‘hours of electric needle agony’ business? Spare a thought for the kid in The Last Guardian. 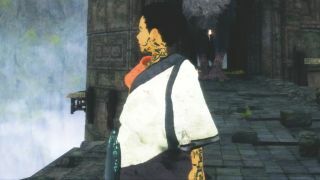 His dramatic markings only showed up after he was *slight spoiler* regurgitated by Trico. Ick. Bet Mr Needle doesn’t seem so bad now, eh? Jason Brody’s sandbox is obsessed with tatts. Every time J-Bro levels up, the tribal ink on his forearm gradually spreads outwards. Then there’s Buck Hughes. This vicious Aussie ex-army man has a huge male deer emblazoned on his chest – and it’s labelled, too. Hey, you never know when you might forget your name. Call us fraidy-cats, but the idea of a needle coming within 14 square acres of our precious eyes makes us want to crawl in a corner and cry. Luckily, Faith Connors is a lot braver than us. She got her dramatic eye tatt to commemorate her first run, then her ‘circuitry’ arm ink after busting into Silvine Security. Kratos’ iconic tatts aren’t body ink at all – instead, they’re actually the ashes of the Ghost of Sparta’s slain family, forever bound into his skin to remind the fallen god of his tragically barbaric past. Still, we’re too scared to omit the slaughter-loving slaphead’s iconic markings over a technicality. Ain’t it grand when function and fashion unite? Ellie’s tatt in Naughty Dog’s upcoming apocalypse sequel isn’t just rad, it also covers up her bite marks – not everyone believes that ‘I’m immune to the Cordyceps Infection’ story, after all. Could the moth on her arm have deeper meaning? We can’t wait to find out.